Landscaping doesn’t have to be restricted to hardscapes and plantings. When you add a water feature, you open up your yard to much larger opportunities for visual impact. A water feature such as a pond invites many interesting visitors, like birds, dragonflies, frogs, and other wildlife, as well as offers a tranquil setting in which to relax and enjoy. But before you start digging, make sure you’re ready. Water features can take time, energy, and a healthy budget to install. This post will help you decide if a water feature is right for your home. Take our patio style quiz for insight and inspiration! If you’re thinking about adding a pond, waterfall, or other large water feature to your landscape, consider some of the benefits that are associated with them. Water features are good for the spirit. They provide soothing sights and sounds that help promote relaxation and reduce stress. Sitting near a pond, watching the fish swim, or just enjoying the peace of your garden is a wonderful way to reduce stress and relax after a long, hard day. The sound of moving water is a great way to mask or cover up unwanted noise from a busy roadway, city street, etc. It doesn’t take a lot of water or a large waterfall to create enough of a ripple and buffer to do the trick. The results are amazing and so soothing. Use water features to add a unique and specific definition to your landscape. Create added visual interest with a water focal point. A water feature also adds a designer touch to your property. It provides sound and movements to an otherwise still area. This offers definition and provides more opportunities to use your yard. Wildlife is attracted by water. 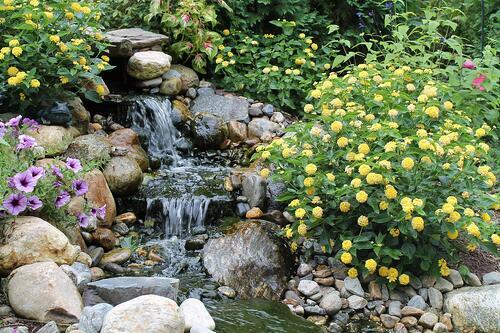 By installing a water feature to your home, you will attract songbirds and other native wildlife to your property. This is especially rewarding if you are a birdwatcher, or if you simply want to expand the ways you can fully enjoy your property. Active wildlife is a sign of a healthy ecosystem. A well-maintained and designed landscape may increase the value of your real estate investment by as much as 20%. Not only will this offer increased enjoyment for your personal use, it will offer an increased selling point should you decide to sell your home. Prospective buyers will pay more for an established landscape, just as people will pay more for an already updated kitchen or bathroom. Water gardens also add curb appeal, which helps to increase property values even more. If you have a smaller outdoor space, do not worry. A water feature is still within reach. Water elements can be as simple as a small waterfall or fountain. Well-designed pondless water elements such as these don’t require much space, so you can still enjoy the tranquil sounds of moving water and the benefits of increased wildlife even with a smaller property. A water feature can be tucked into an area that may be otherwise unusable. Often, smaller, awkward spaces are an options for a pondless water feature. 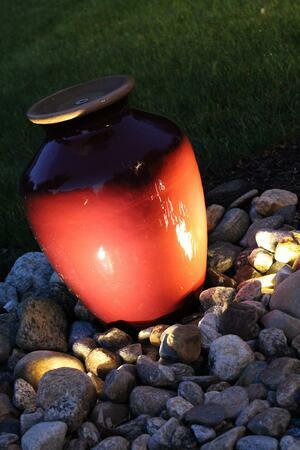 This way you can turn an otherwise unusable area into a beautiful focal point. Unlike swimming pools or hot tubs, which require a lot of monitoring, chemical testing, and cleaning, water features can supply you with texture, natural sounds, and visual interest without much ongoing maintenance at all. Simple wall fountains, cascading waterfalls, and pondless water features are great low-maintenance water feature choices. The water in these features re-circulates, without impacting your water bill. The constant movement helps prevent buildup of algae as well, which means less cleaning for you. Pondless water features are also great for families with young children, because they don’t pose the safety risks that a swimming pool or hot tub might present. There are many options as to which water feature is right for your space, budget, and personal preference. The average pond is about 11 feet by 16 feet in size, but can be as small as 6 feet by 8 feet, which uses about 550 gallons of water. 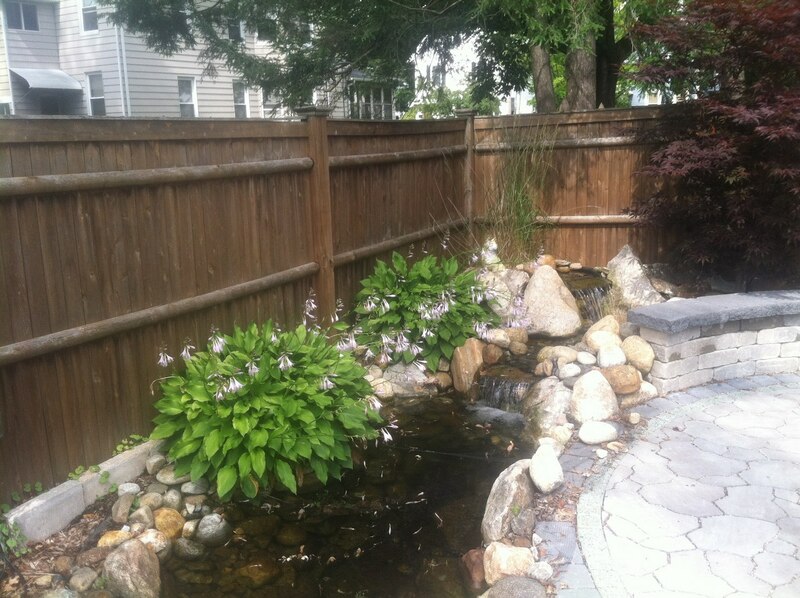 We generally recommend leaving 2-3 feet of space surrounding the pond for landscaping to tie the look together. Ponds are usually the most costly water feature option to install, ranging anywhere from $7,500-$25,000 or more depending on the size and and the rock work involved in sculpting the land. Ponds do require some maintenance, such as cleaning the skimmer and pump every 10-14 days. 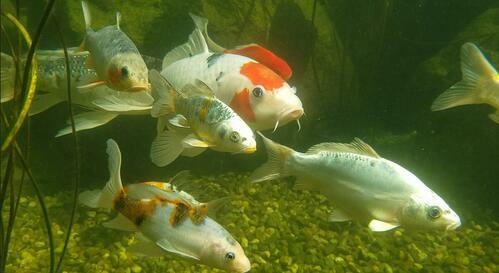 It’s important to add beneficial bacteria every week to maintain the health of the pond as well. 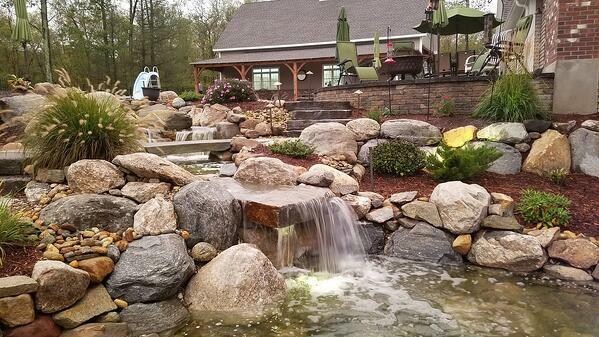 A pondless waterfall is a great smaller water feature option, and can be placed almost anywhere. The installation costs can vary based on the size and rock work necessary, but prices generally range from $2,500-$15,000. On a more elaborate water feature with multiple stream beds and waterfalls you can expect to spend upwards of $40,000. Refilling the reservoir every few weeks to account for evaporated water is about the extent of needed maintenance. This takes but a few short minutes to do. These can be as small as 4 feet by 4 feet, and so are among the most versatile water feature options. Low in cost, at an average of $2,200-$5,000 to install, bubbling rock formations only need a few minutes of maintenance every few weeks, to add water to account for evaporated water. These are bigger than a bubbling rock formation, but offer more relaxation given the sound they emit. Installed at around 8 feet by 8 feet, this is a medium-sized option. The average cost to install runs about $4,000-5,000, and maintenance is just as easy as with bubbling rock or pondless waterfalls. Just add a bit of extra water every few weeks or so. This is the smallest option for a water feature. 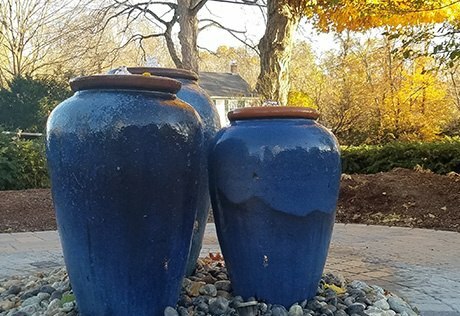 Vase fountains just need 16 inches by 16 inches worth of space for installation. They cost between $1,800-3,500 on average to install, and require very little maintenance. Simply add a bit of extra water every few weeks to account for what evaporates and you’re in business. Possibly the most versatile option, garden fountains come in a variety of sizes and can fit in just about any space. They can work well in front yards, backyards, and near circular driveways. Installation costs can be fairly minimal and competitive, at $1,500-2,500, though larger fountains can cost upwards of $5,000. Refilling the reservoir occasionally and running fountain cleaner through the system every few weeks is necessary, though this only takes an hour or so every few weeks. While the benefits of water features are largely aesthetic, there are some practical considerations when choosing the right water feature for you. Just as with real estate, the key factor in where to put your water feature is location, location, location. You don’t want to put a pond in a low spot that gets a lot of runoff when it rains, because that can lead to flooding. Overflow from a lawn could bring with it chemicals or fertilizers into the pond that could harm wildlife or water plants. If you're going to invest money on a water feature, you want to be able to see it - from inside the house and outside. Good visibility is key, to maximize your personal enjoyment of the water feature. Room for seating, such as a bench or chairs on a small patio, will enhance usability. Keep effects of the sun in mind when choosing a location. Any water feature you choose will need about half a day’s sun, away from large plants that can cause debris and over-shading. An outdoor rated GCFI outlet is required for water pumps. You may want an aerator, too, especially if you add fish to your water feature. An outlet also provides easy access for outdoor lighting and other accessories. Be sure to have all of the utilities located before you dig. This is a huge safety requirement. It is a free service that arranges for all of the utilities on a property to be marked. If you work with us, we will take care of this for you. Before you dig, check local regulations and zoning restrictions. If you belong to a neighborhood homeowners’ association, check to see if you need approval to add a pond to your property. Like with most home improvements, your budget will dictate the size of your pond and the materials you will be able to use. Don’t forget the additional costs, such as plants, fish, pots, fertilizer, rocks, thermometers, and test kits. A local landscaper or pond professional can help you choose the right equipment and help you tailor your water feature dreams to your practical budget. Operating costs for water features are fairly minimal once installation is complete, though there can be some additional expenses. 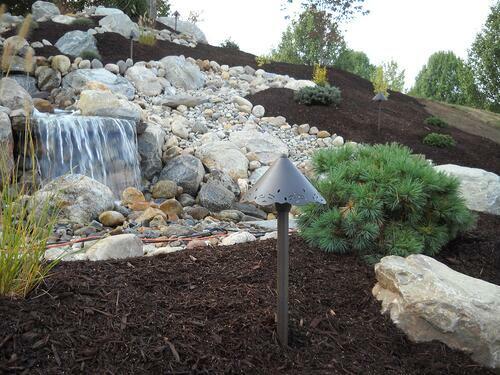 Water features with pumps, chemicals, or external water supplies can add to your monthly bills. With any addition to your property come potential downsides. For a water feature, in particular, insects are a slight possibility. If the water feature is not installed properly insects can become a problem, so be prepared with insect repellent handy. Be ready, also, for the potential increase in deer, racoons, great blue herons and rabbits, but also watch for foxes and coyotes and other predators. Small pets and children may be at risk, so keep a close eye out. Speaking of children, water is always a potential hazard, and it’s important to have eyes on children at all times when a water feature is present. A pondless waterfall or fountain can be a safer option than a pond, but be sure to consider water safety with smaller water features as well. Before installing any water feature, be sure to consider potential flooding. Consult with a water feature installation expert to learn more about your risk. Check with your homeowner’s insurance policy to review potential flood or water damage coverage as well. A water feature provides a great deal of value to your yard, both in terms of traditional property value but especially in terms of your personal enjoyment. With the right considerations, you can enjoy a wonderful backyard scene that satisfies any budget, and any size space. Ready to get started? Take our patio style quiz now.